Will Smith has portrayed a foul-mouthed cop, an agent working for an extra-terrestrial immigration organization, a famous boxer, a down-on-his luck and dirt poor single-father, an agent hunting down rouge robots, a fish, a dating doctor, and numerous other roles, and he’s nailed every one of those roles with a pinpoint precision most actors never find. Have they all been good movies? No. Has he given all those performances his all? Yes. 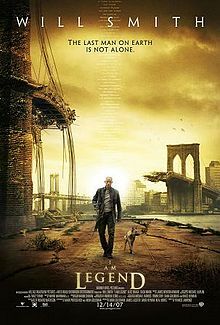 That pretty much sums up “I Am Legend”; without him, it could be a mediocre, generic horror flick, but Smith transforms it into a powerful, depressing, and unbelievably intense drama that pulls at your emotions many, many times. Robert Neville (Smith) walks the empty streets of New York, searching for food, finding good movies at the Rental store, playing golf off of fighter jets, and looking for survivors. He’s the last man on Earth. After a cure for cancer, made from a virus, destroys most of the population and turns the rest into vampire-esque creatures, Neville finds himself alone in a deserted city, desperately trying to find a cure for the disease. Imagine Cast Away meets 28 Days Later or any other zombie, (or preferred horror creature) movie and you’ve just about got it. Neville goes around the empty New York talking to mannequins he’s placed in his favorite places to visit, hunting deer that run all over the city, and generally just tries to make the most of it. At his apartment, he puts on tapes of old newscasts, and takes other measures to restore some small shred of normality to the situation. Will Smith is alone on screen for the majority of the film, his only companion being his dog, Sam, who plays the equivalent role of Wilson in Cast Away. Smith, with apparent ease and effortlessness, shows us exactly what being the last man on earth might do to someone; at times, it’s haunting. Sometimes, it’s powerful, and other times, it’s just downright heart wrenching. Smith is one of the best actors of our time, and “I Am Legend” is proof. The special effects are, for the most part, mind-blowing. The vampire creatures sometimes look a bit fake, but all the shots of the empty New York are spectacular. Once you start thinking about it, you have to wonder how they edited out thousands of people, cars, etc, and replaced it all with run down buildings, crashed cars, etc. Will Smith’s performance, mixed with the awesome effects, give the film a sense of realism that is eerie, and makes the movie all the more intense. And intense it is. There are many scenes where there are no creatures, no threats, no nothing that just scare the daylights out of you. When there is something strange going on, it’s even more intense. And when the vampires are actually there, you’re literally on the edge of your seat. There’s a lot of films out right now, many that are vying for the Oscars and other various awards. “I Am Legend” probably won’t, and rightfully shouldn’t, be considered in all of that, but if you don’t care about catching up on the art-house movies (a difficult job I’m currently attempting) then “I Am Legend” should be a fun way to spend a night. It’s a mainstream movie that does some things most mainstream films never do, which I commend it for. Given the size of the audience tonight, I doubt the last man on earth will be horribly lonely this Christmas.